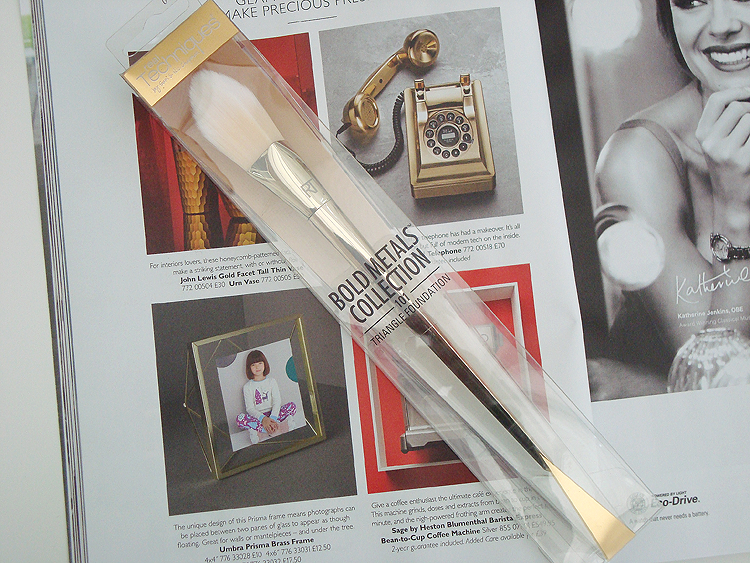 When I first saw the Real Techniques Bold Metals Collection Brushes I was very, very excited. A small set of 7 different make-up brushes that start from £10 per brush in price which are all finished with a beautiful metal sheen. They are incredibly beautiful make-up brushes - too pretty to use, perhaps?! I have longed for a Real Techniques Bold Metals brush for a long while now. I know £20 for one brush is rather pricey, and most certainly pricier than the standard Real Techniques Brushes, but I believed splashing out and treating myself to one of these beautiful brushes as a little treat to myself would be fair enough. Luckily though, my sister bought me one for my birthday in October. The brush she bought for me was the Real Techniques Bold Metals Triangle Foundation Brush. "The Bold Metals make up brush Collection by Real Techniques pairs unbelievably soft bristles with striking metallic detail. Handles are weighted for optimal control and comfort. Triple funstion: the flat edge covers large areas of the face, the angled edges contour around the eyes and nose, and the tip spot covers blemishes. Softer than ever bristles, for our most luxe feel to date." At the moment I am applying my foundation with either the Real Techniques Blending Brush, the Real Techniques Foundation Brush or my Bella Beauty Make-Up Blender. I rely heavily on Real Techniques for applying my make-up with so I had very high hopes for this brush too! It took me quite a long time to pluck up the courage to even attempt at using this beautiful brush - I just couldn't bare to dis-colour the bristles. When I finally got fed up with staring at my make-up brush through the packaging, I pulled it out of the little box and I was surprised at two things. One, how heavy the handle was and two, how synthetic the bristles felt. I know they are made out of synthetic taklon but the bristles in this foundation brush feel more synthetic than the bristles on any other Real Techniques brushes I have tried. Whilst they are soft and unlike other reviews I had read, I don't find the bristles hurt on the face when used, but I was surprised at the feel of the bristles. I liked the weight of the end of the brush which made it easy to apply foundation with due to the amount of control you are given over the brush. When I read some other reviews on this Real Techniques Bold Metals Triangle Foundation Brush I was surprised to see that it only received 2 stars on the Boots website. 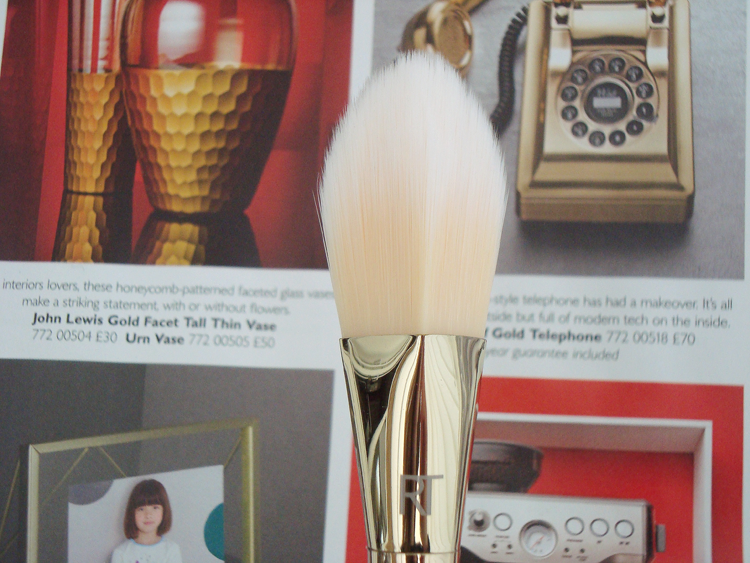 A lot of reviewers stated that the triangular aspect of this brush didn't improve the application of foundation like you would expect due to it's pointy tip which should be perfect for covering the smaller areas of the face that is usually tricky when using a regular buffing brush. I also read that a lot of other people found that this brush was fairly streaky when applying foundation but I haven't found this at all, although I do believe the regular Real Techniques Foundation Brush is guilty of this. I really expected to love this brush but in all honesty, I am not in love with it. Okay let me re-phrase that. I am not in love with it for its application but I do love the look of it and it looks truly wonderful in my make-up brushes holder. For the price of the brush I really expected more. I loved the weight of the handle but the bristles felt too synthetic for my liking, even plastic-y, if it were and my foundation looked no better than if I were to apply it with a cheaper brush. Ah, its a shame you don't like it but i'm so happy that you've given your honest opinion! I probably would have purchased it because of how pretty it is as well! Love the honesty. 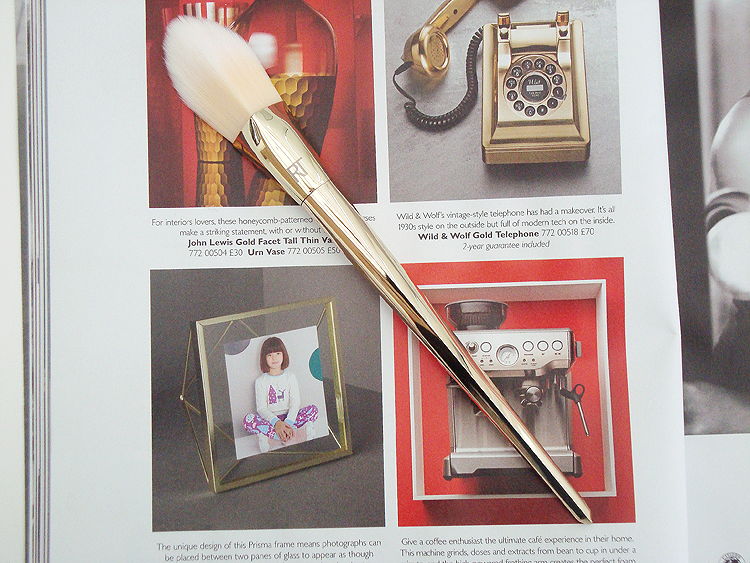 I have the bold metals pointed crease brush and was considering the foundation brush but maybe not then.